Skynet sends a second terminator back in time to destroy the leader of the human resistance while he is still a boy. Because this acts as my fifth review of 1991’s Terminator 2: Judgment Day, I’ll cut short my usual comments about the movie. If you’d like to read my full thoughts, click on this link. To summarize, T2 remains one of the few sequels that betters the original flick and it offers an all-time great action film. Despite some dated visual effects, the movie holds up really well after more than 25 years and continues to thrill. Terminator 2: Judgment Day appears in an aspect ratio of approximately 2.35:1 on this Blu-ray Disc. This became a satisfactory presentation. Overall definition seemed positive. A few wider shots betrayed a bit of softness, but the majority of the film offered pretty concise imagery. I saw no issues with jaggies or moiré effects. Edge haloes and print flaws appeared to be absent, and – in a break from the prior Blu-ray – this one lacked obvious use of digital noise reduction (DNR). The latter technique created most of the earlier BD’s issues, but with a much more obvious layer of grain here, this release felt much more natural and film-like. In terms of colors, T2 largely opted for a blue-oriented palette, with some ambers thrown in as well. The disc replicated the hues as expected and looked fine. Blacks were dark and dense, while shadows seemed smooth and clear. I thought the Blu-ray offered a solid reproduction of the film. For this Blu-ray, we get a DTS-HD MA 5.1 soundtrack. It provided a pretty robust soundfield that encircled the viewer throughout the movie. The forward spectrum sounded lively and active, as I heard audio from all three front channels nearly all the time. In addition, the mix provided a nicely integrated sound, as the audio in the front blended and panned between channels very cleanly and smoothly. The surrounds kicked in a great deal of ambient information; they didn't quite keep up with the forward channels, but they held their own and added a nice dimensionality to the track. All in all, it's a fine mix that really helped involve the viewer in the experience. Quality also seemed excellent. Although much of the dialogue had to be dubbed - and further altered, in the case of Furlong, since his voice changed during the shoot - speech always sounded natural and distinct, with no edginess or problems related to intelligibility. Brad Fiedel's excellent score sounded crisp and warm, with all aspects of it seeming clear and well defined. Effects were clean and realistic – or hyper-realistic, when appropriate - and they showed no signs of distortion, no matter how loud the track got. The entire package kicked in some taut and strong bass throughout the film, and the result was an impressive soundtrack. How did this 2015 Blu-ray compare to the Skynet Edition? Audio remained similar, as this disc’s 5.1 mix matched well with the older release’s 6.1 track. Visuals showed obvious improvements, mainly due to the absence of digital noise reduction. The 2015 transfer also lost the minor specks of the older disc, but it was the improved definition of the DNR-free image that made it a notable step up in quality. As far as I can tell, the 2015 remaster drops all the extras from the 2009 “Skynet Edition” – and the 2015 disc’s components date back years. As expected, we get both the film’s theatrical (2:16:34) and Special Edition (2:33:23) cuts. The review linked at the start of this discussion discusses the two in some detail, so I’ll send you back to that article for the specifics. I like both the theatrical and SE cuts and don’t really find one to work better than the other. Each satisfies in different ways. Note than the “Extended Special Edition” doesn’t seem to appear here. That one tacked on a little extra footage to the SE. I’m not wild about it – mainly because the ESE’s coda isn’t good – but it’s still a disappointment that it doesn’t pop up on this release. For video piece, first we find The Making of Terminator 2, a 30-minute, 38-second piece that originally appeared on the 1991 limited edition CAV boxed set of T2. 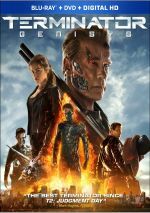 It includes comments from writer/director James Cameron, special makeup producer/Terminator effects producer Stan Winston, ILM VFX supervisor Dennis Muren, ILM assistant VFX supervisor Mark Dippe, ILM computer animation supervisor Steve Williams, and actors Arnold Schwarzenegger, Linda Hamilton, Edward Furlong, and Robert Patrick. “Making” looks at cast and performances, Cameron’s work as director, sets and locations, various effects, stunts and action, and story/characters. “Making” benefits from some good behind the scenes footage but it loses points due to a lack of cohesion, as the program flits from one subject to another without much clarity. Still, it gives us a decent look at the movie from a POV close to that of its creation. A 22-minute, two-second piece called T2: More Than Meets the Eye, the second show takes a much more specific focus on the movie. Originally created for Showtime, it details the changes made between the theatrical cut of the film and the special edition version. It offers nores from Cameron, Schwarzenegger, Hamilton, Furlong, Patrick, Winston, and actors Joe Morton and Michael Biehn. On the positive side, we get a discussion of the originally omitted sequences and the reasons they got dropped. However, the program actually shows these clips as well, which means much of the running time is filled with film snippets that become redundant for those of us who've already seen the SE. This aspect of “Eye” also makes the show a really bad viewing choice for anyone who hasn't already watched the SE, so skip it until you've done so. The program offers enough good info to merit a screening, but keep the remote handy so you can zip through the movie clips. From 2003, the 24-minute, 22-second documentary No Feat But What We Make comes next. It offers interviews with Cameron, Muren, Dippe, Winston, ILM CG Supervisor John Knoll, ILM Animation Supervisor Steve “Spaz” Williams, and filmmaker Peter Jackson. Most of these notes were new in 2003, but the remarks from Williams and Dippe come from 1993. As you probably figured from the credits of the speakers, this show concentrates on visual effects. It covers a little history and gets into the use of CG for Cameron’s The Abyss. We get some notes about Cameron’s concept for a liquid metal character, hear about the use of morphing and its negative impact on the industry, various threats felt by some in the business, and a general discussion of the modern use of CG in movies. “Feat” doesn’t really focus on T2’s visual effects, as instead, it prefers to inspect the field as a whole. This gives it an interesting perspective and makes it unusual and provocative. The inclusion of material from other films is also worthwhile, and it’s cool to hear from Jackson. Usually this kind of program suffers from tunnel vision, so normally we’d not hear anything about other flicks, much less get comments from a different director. Overall, “Feat” seems illuminating. The extras end with T2: On the Set, an eight-minute, 22-second “production montage”. This shows raw footage from the set taken during various parts of the shoot. I love this sort of material and generally like “Set”, but the brevity of the piece makes it something of a disappointment. It jumps from scene to scene so rapidly that we don’t get much depth. One of the all-time great action flicks, Terminator 2: Judgment Day remains very entertaining and exciting after 26 years. The movie doesn’t qualify as my favorite in the genre, but it’s quite close to the top. The Blu-ray presents very good picture and audio but it lacks many of the pre-existing supplements. While this becomes the best presentation of the film itself to date, the lack of the prior disc’s bonus features disappoints.